Nouveau Plan Complet Illustre dela Ville de Paris en 1877 Divise en 20 Arrondissements. 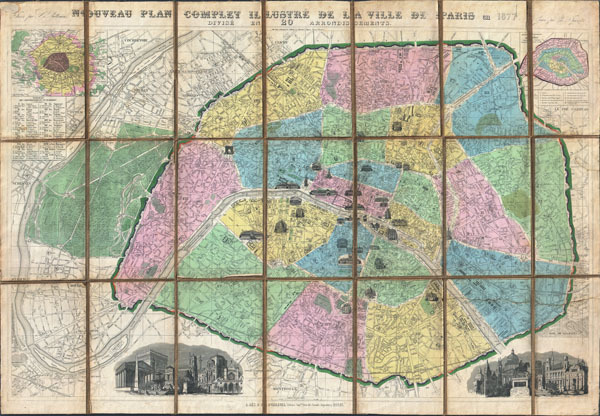 A spectacular 1877 folding pocket map of Paris, France by the French cartographer A. Vuillemin. Covers the entire city and environs in spectacular detail at the level of individual streets, bridges and buildings. Divided according to 20 Arrondisments. Important and historic buildings are shown as views. These include the Arc de Triomphe, the Palace Royal, Notre Dame, the Hotel des Invalides, the Pantheon, the Tour St. Jacques, and the Hotel de Ville, among others. An inset map in the upper left quadrant shows the greater Paris vicinity as far as Versailles. Another inset map, in the upper right quadrant, details the Arrondisment system. In the lower left and lower right quadrants there are beautiful engraved views depicting the monuments of Paris in composite. All text is in French. Engraved by Charles Dyonnet for A. Vuillemin in 1877. Very good condition. Original sail cloth or linen backing in good condition. Minor soiling to edges.